Height 15 cm. Saint Petersburg, The State Hermitage MuseumInv. No. Б. 286. The god is represented standing. The right hand and the attributes in the left hand have been lost. The god’s shoulder is covered with a cloak whose numerous soft, deep folds form a zigzag ornamentation. Poseidon is represented with a long, curly beard and hanging moustache. The head, encircled with a headband, is turned to the right. The hair, which frames the face, is pulled back in a small plait. The oblong, prominent eyes were originally inlaid. The musculature is attractively modelled. The abdomen and the contour of the hips are well drawn. A magnificent example of the severe style, produced by a workshop in southern Italy. Stéphani, Bull. Ac. Sc. de St-Petersbourg 17: M2L. gr.-rom. III no. 621; O. Waldhauer, Eine Poseidon-statuette der Ermitage, AA (1928) pp. 518—522, pl. 1—3; Bronzes antiques, (note: illustration 6 Exhibition catalogue) (Leningrad, 1973) no. 8 p. 12. In Polyklet. Der Bildhauer der griechischen Klassik, Liebighaus-Museum alter Plastik (Frankfurt-am-Main), 1990) no. 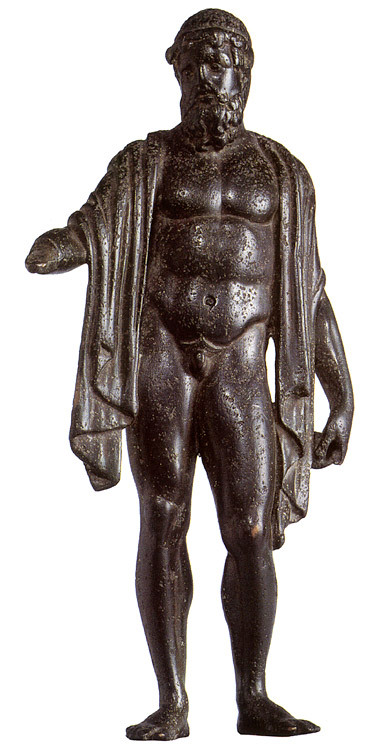 200 p. 662, this statue is identified with Zeus. © 1993. Photo, text: Olympism in antiquity. Olympic Museum Lausanne. Bertelsmann UFA. Industria Gráfica S. A. Barcelona, 1993, p. 74 cat. no. 17.